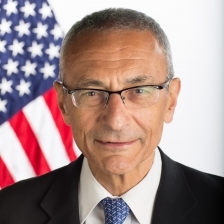 While most of them appear to refer to items that have already been publicly reported, mentions of Bermuda can be found in the ‘Podesta Emails’, a mass release of emails by Wikileaks which were apparently obtained by hacking the emails of Hillary Clinton campaign chairman John Podesta [pictured]. A search of the Wikileaks website shows that as of this writing there are, technically, 31 files showing for Bermuda under the Podesta section, however some are repeated mentions from the same email trail and some mention the word Bermuda but don’t specifically pertain to us. The emails stem back to 2007, and a few mention 2012 Republican nominee Mitt Romney’s use of a Bermuda company, something that was widely reported at that time. Multiple emails mention closing the so-called ‘Bermuda reinsurance loophole’, something which was publicly stated on Hillary Clinton’s campaign website earlier this year, and reported on by Bernews at that time. One email contains a Bermuda reference that does not appear to have been widely reported on prior, with a transcript of a speech Mrs Clinton gave in January 2016 in Burlington, Iowa, saying: “I have proposed what I call a Fair Share Surcharge, because here’s what I’m worried about. Other emails in the Podesta files that contain the word ‘Bermuda’ are referencing publicly available news reports, such as two quoting former U.S. Consul General to Bermuda Gregory Slayton who was supporting a Republican candidate, a reference to golf in Bermuda, and a reference to the ‘Bermuda Triangle’. WikiLeaks says it has around 50,000 emails to and from Mr Podesta, and has been releasing them in batches. The emails have been the subject of numerous international reports, and on October 17th, WikiLeaks posted on Twitter that its Julian Assange had his internet access cut off by Ecuador. Ecuador later confirmed this saying, “Ecuador granted political asylum to Julian Assange in 2012 based on his legitimate fears of political persecution because of his journalistic activities as the editor of WikiLeaks. “The Government of Ecuador respects the principle of non-intervention in the internal affairs of other states. It does not interfere in external electoral processes, nor does it favor any particular candidate. According to CNN, Mr Podesta said, “It is now clear that the illegal hack of my personal email account was — just like the other recent, election-related hacks — the work of the Russian government. As far as how Mr Podesta’s email was hacked, Salon reports that, “A researcher at the company SecureWorks told Motherboard that Podesta was sent an email on March 19 that appeared to have come from Google. The Democrats have proven time and again that they are no friend of Bermuda. Sad that after decades of effort to properly educate that they continue to view the services Bermuda offers the U.S. as harmful. Why should they be? They’re elected to look after the interests of their voters’ interests. should this surprise any one that (1) people are shielding assets in Bermuda, and (2) that this raises the ire of US Taxpayers? You hate immigration (well at least immigration of a certain hue). You hate people that don’t look like you. And yet you have the nerve to call others Trump supporters? Absolutely Steve. And they also like to ignore the fact, when there is a natural disaster, the money to pay for it comes out of Bermuda Re-Insurance companies which they are trying to destabilize. The Russians did it…give me a break! The Dems have been at this for years…”electioneering” Funny how Obama states “Election fraud – what does that even mean?” – yet he is now quick to now federalize the monitoring of the elections, bring in the U.N. as overseers and accuse Trump of being in cohorts with Russia. The media propaganda in support of this Democratic campaign is nauseating.